My friend Kara Dennison likes to give everything she watches three episodes to capture her eye. I decided to do the same with the latest entry in the Marvel Cinematic Universe, Marvel’s Luke Cage; judging from my reaction to the last bit of “Who’s Going to Take the Weight?”, I think I’m going to have to plow right through the rest of the episodes today and tomorrow. Note: Oh yes, there will be spoilers for these first three episodes. 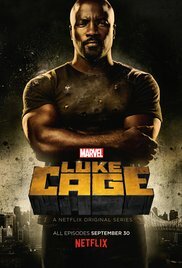 Introduced as private investigator Jessica Jones’ stalkee-fixation, then revealed to be a nigh-invulnerable powerhouse of his own as well as a tragic figure, creator Cheo Hodari Coker has moved Luke Cage from midtown Manhattan to black (and gentrifying) Harlem, and populated it with a host of characters who rarely get screen time in such a mainstream production. I lived in Harlem for about six months back when I was an assistant to a luxury real estate broker and seeing its streets and its people engendered both a feeling of nostalgia as well as a feeling that I had never really been part of Harlem. But Hodari Coker (who also co-wrote the 2009 biopic Notorious about the life and death of rapper Notorious B.I.G.) is familiar with these streets, these people, its struggles, and its dichotomies. This is most evident in the writing of cousins Councilwoman Mariah Dillard and nightclub owner/gangster Cornell “Cottonmouth” Stokes, played by Alfre Woodard and Mahershala Ali respectively. The former is a person who believes that Harlem can begin a new Renaissance and return to its glory, the latter is one who believes that Harlem should retain its status quo where people like him run the show. And yet, both of them are tied to each other, connected by both family and a money laundering scheme because they know and recognize that both of their goals are nigh-impossible to achieve without a little cheating of the system. In these first three episodes, Luke Cage (Mike Colter) stands outside of that system. After his destructive rampage in the latter episodes of Jones, he’s become a fugitive, working under the table as a dishwasher at Cottonmouth’s club and in a barbershop run by a former hoodlum named Pop who claims that his barbershop is “Switzerland” for the feuding gang and street elements of Harlem. Of course, one can’t make a claim like that in a hero’s journey story and so Pop gets gunned down by accident in Episode 2, prompting Cage to re-enter the world and to embody perhaps a third point of view when it comes to Harlem’s destiny. I find that I like all of these characters and I want to find out more about how they will fit into the new landscape which Luke Cage is creating for the MCU Harlem. I like how Detective Misty Knight (Simone Messick) has a Sherlock-ian kind of “mind palace” where she can visualize how a crime scene actually happened just by having been there and viewing the photographs. I like how Cage’s Chinese landlord Connie (Jade Wu) speaks almost perfect English because her husband’s family (and she) have been Harlem residents for years and are also part of its community. This wouldn’t be the case if the wrong actors had been cast, and everyone in this series (so far) seems to be perfect for their parts. This is a story that I’m really excited to continue watching despite some rather stupid blunders in the second episode (secrets shouldn’t be shouted about in the middle of your shop in the daytime, Pop!). I hope that I don’t get disappointed.